Recently, I’ve been eating fresh fish. It’s very nice and as it’s new to Huwi and I (my housemate that has shared in this wonderful cooking), I thought I’d photograph the experience. So on this page you’ll see the fish we’ve eaten. Fried some chopped onions and loosely-chopped garlic in oil. 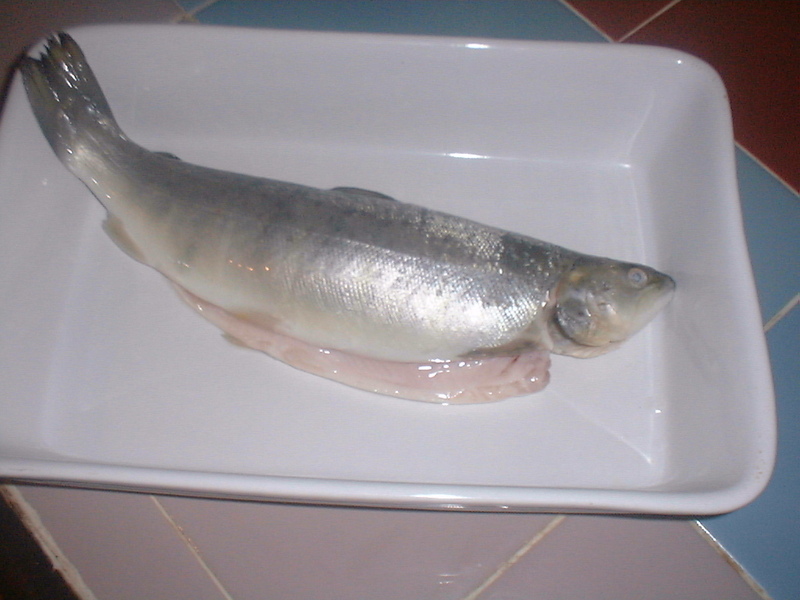 Placed fish in dish (see picture above). Poured wine, garlic and salt over fish, and placed in an oven at 200C for ~30-40 minutes. Removed skeleton from the sea bream, and chopped his head off. Then served him with lemon and fresh bread. Diced the celery and onions and fried them lightly in butter, until soft – but not brown. Meanwhile, finely chopped some bread into crumbs, and added to the celery and onion mix. Allowed it to cool so it was ok to touch. Wash the trout out, and place in a cooking dish, and stuff the fish full of the stuffing. 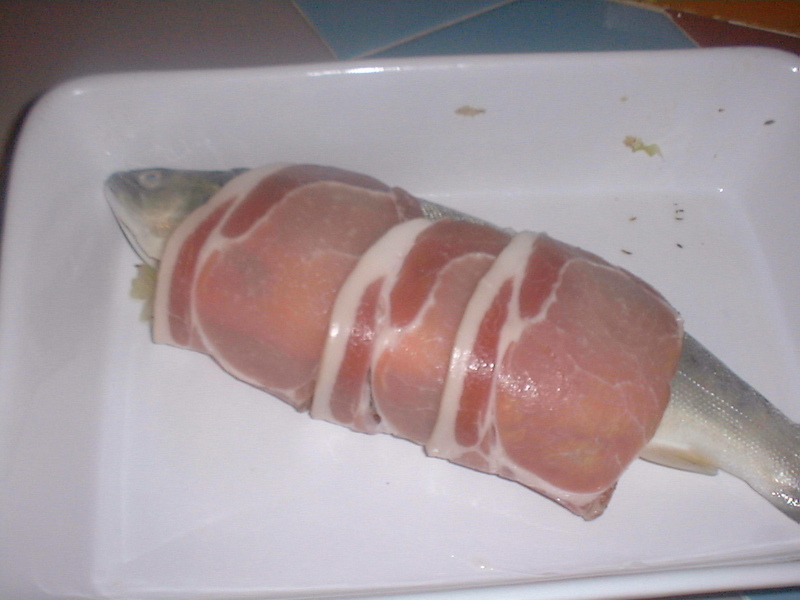 Wrap the fish in bacon (see below) and season the fish with salt and pepper. Cook in the oven for 35 minutes at 200C, and cut down the spine of the fish, carefully removing the skeleton and the head of the fish. Serve with green vegetables, and potatos, or bread, etc. I bought this fish – quite expensive at the time, compared with the other fish. There was a hidden catch to it though, that I never bothered to ask about… When I came to wash the fish, I noticed that there was no opening. I had to gut it. But that was Huwi’s job; a braver man than I for doing such a thing, and full credit goes to him. I couldn’t have done that. Pre-heated oven to 250C (gas-mark 8/9). Washed (and gutted) the bass thoroughly. Chopped up a small quantity of garlic, onions and ginger (two tablespoons worth is sufficient – it’s quite potent). Get a quantity of greaseproof-paper, enough to wrap the fish in. 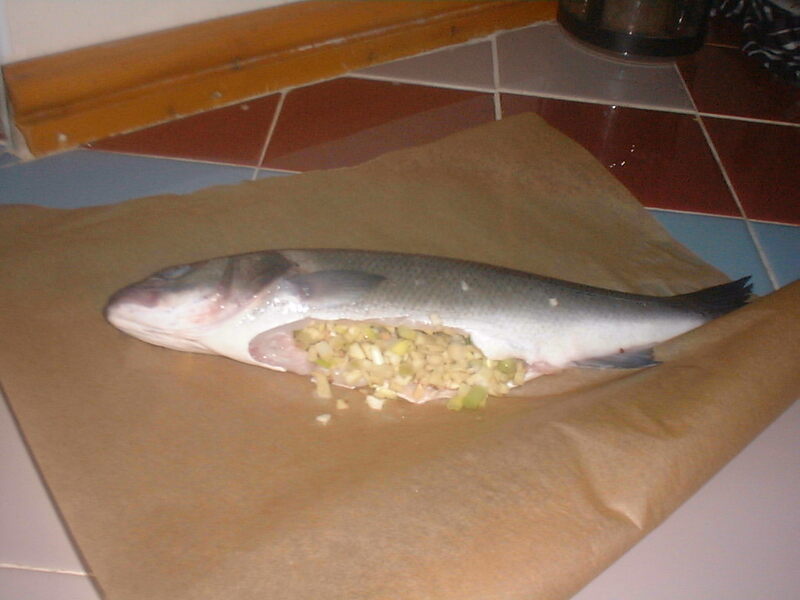 Stuff the fish and place it on the paper, and wrap it well. Do the same again, in tin-foil, and place in a large enough baking-dish, and place the fish as-is, in the oven. The fish will cook and semi-steam lovely in the foil and paper. Let the fish cook for 25 minutes. Meanwhile prepare the sauce. Heat very slowly one cup of light soy sauce and one cup of sugar together, until the sugar dissolves, but don’t let it boil. Once the sugar has dissolved, keep the liquid warm. 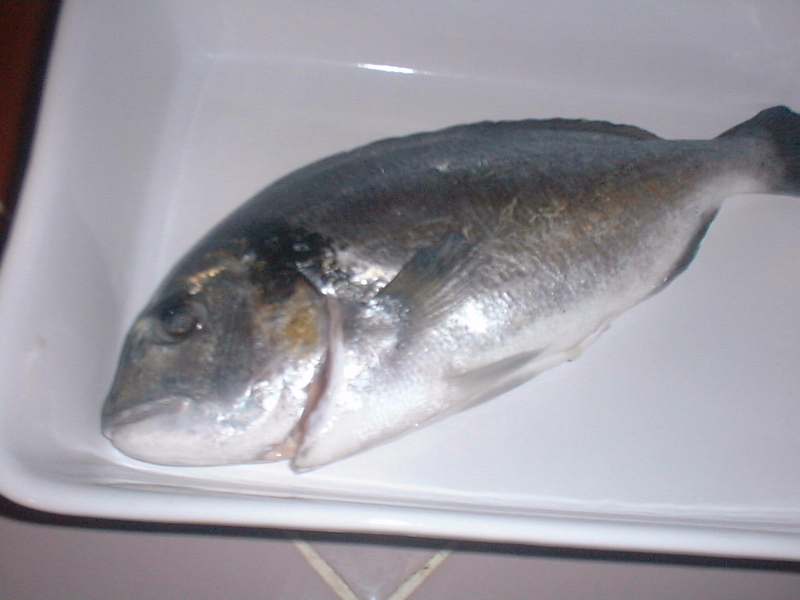 Remove the fish from the oven, and dehead, and debone as with the other fish. Serve with vegetables, bread, and pour on the sauce.